Well, the day we wished would never come is unfortunately here. The Philadelphia Eagles have been eliminated from the 2018 National Football League playoffs. After such a rollercoaster season, they had a 4-4 start that had fans wondering what had gotten into the reigning Super Bowl champs. After winning the last three regular season games and making the playoffs, it was hard to watch them lose in such a heartbreaking way. At the start of the season, Eagles fans had such high hopes. Coming off such a spectacular 2017 season, expectations of the team were high. Now, it was a start of a new season, and the Eagles were hungry for more wins. Since Carson Wentz’s ACL was not fully healed from his prior injury, the season started off with Nick Foles as quarterback. This led to a great first game as the Eagles got their first win over the Atlanta Falcons. They even perfected the trick play that the New England Patriots failed to execute where wide receiver Danny Amendola threw to quarterback Tom Brady. After this, however, the Eagles began to struggle. During practice, running back Darren Sproles aggravated his hamstring; this resulted in him having to sit out for a large chunk of the season. This is the first injury that set the Eagles back. After a loss to the Tampa Bay Buccaneers, they looked to their next game against the Indianapolis Colts. In week 3 however, they got Wentz back, which was a hopeful sign. They ended up winning against the Colts, but it was clear that Wentz was not back to full health. He wasn’t throwing in the same dominant motion as last year and struggled to escape the pocket, which was a big part of his success the prior season. The Eagles also lost a big part of their defense due to safety Rodney McLeod during the Colts game, which plagued the Eagles going forward. They lost their next two games. The team grew weaker when running back Jay Ajayi tore his ACL. The team looked to stay positive, and it seemed to work. They got a win over the New York Giants, but ended up losing their next game against the Carolina Panthers. This loss was especially upsetting because they blew a 17-0 lead. They moved onto the Jacksonville Jaguars; they ended up winning, but not without losing another player to injury. This time, they lost another key defensive secondary player in Jalen Mills. To make matters worse, they lost another player in the secondary in the next game against the Dallas Cowboys. These injuries led to a banged up defense, and the New Orleans Saints took advantage of that by defeating the Eagles 48-7. The Eagles won the next two divisional games against the Washington Redskins and the Giants, but it came with a price. The Eagles discovered a fracture in Wentz’s back, and it was determined he would be out for the rest of the season. So, it was back to Foles to rescue the Eagles. It started to look eerily similar to the previous season, where Foles came in and brought the Super Bowl home. Although they lost their second matchup against the Cowboys, the Eagles won their last three games to close out the season and get the last spot in the playoffs. They battled against the Los Angeles Rams and the Houston Texans and ended up winning both games. They sealed the deal with a win against the Redskins and entered the playoffs. This is where the Eagles really had to show they belonged. They were, of course, seen as the underdogs, but that didn’t stop them. Their first opponent was the Chicago Bears. Everyone, including the announcers, were counting the Eagles out, but they fought until the last second, where Bears kicker Cody Parkey, a former Eagle, missed the kick off two of the goalposts and sent the Eagles to New Orleans. After such a rollercoaster game, the Eagles were ready for their next challenge: the New Orleans Saints. Compared to their last faceoff, this would be an even harder game due to quarterback Drew Brees. Brees has been in the NFL for 18 years and has a few tricks up his sleeve. 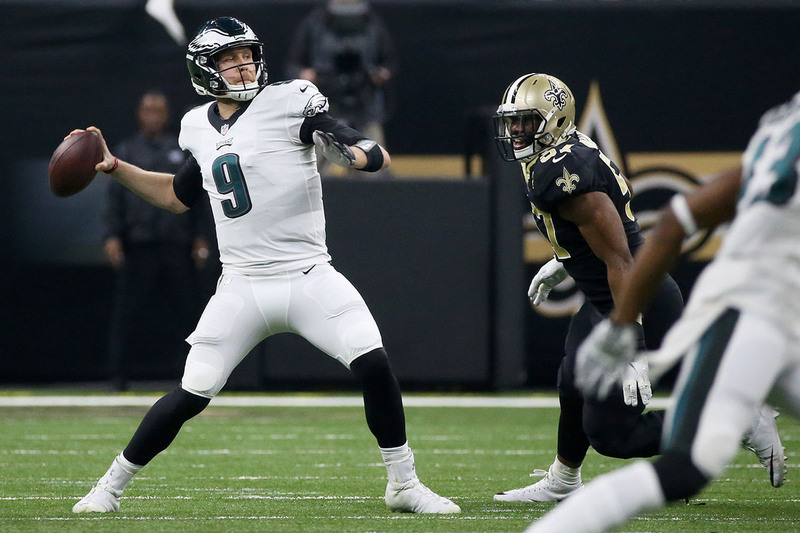 The Eagles fought much harder than the last time they faced the Saints, but in the end, a high pass from Foles slipped through the fingers of wide receiver Alshon Jeffery. Unfortunately, the Eagles lost to the Saints. As an Eagles fan, I’m not upset at Jeffery. Everyone makes mistakes, and that was just one slip-up in his successful career. The Eagles just have to come back and play better than ever. They have already proven they can dominate as long as they stay healthy. So, who’s next?